Aus Eco Solutions recently undertook an ecological burn at Altona. 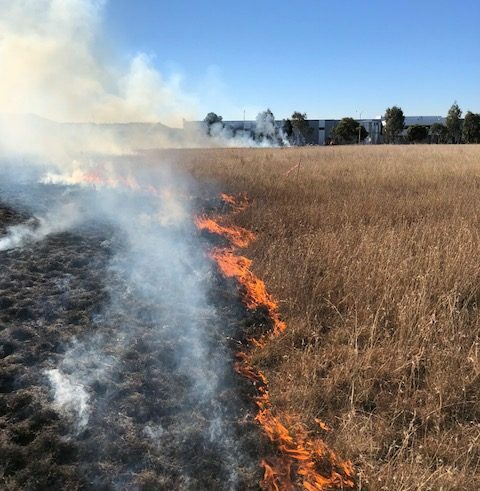 Regular burning of grasslands is essential for proper ecosystem function, as it removes excess biomass, rejuvenates tussock grasses and opens up inter-tussock spaces. These inter-tussock spaces are where a large proportion of the grasslands biodiversity can be found, as they are essential for the successful germination of a large suite of species, including the Spiny Rice Flower (Pimelea spinescens subspecies spinences). Without regular burning, native grasslands degrades rapidly, where the kangaroo grass forms a thick monoculture that smothers out any competing natives. If left long enough without fire, the kangaroo grass itself will also begin to senesce and be replaced by weeds. 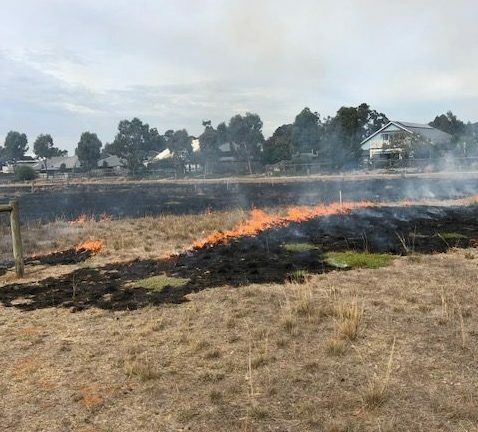 An ecological burn of the 2ha site on Burns Road in Altona was conducted in late April 2018. The burn had a very high coverage; excluding the 1.5m wide slashed firebreak; coverage is above 95%. This area was last burnt in Autumn of 2015, and as such had quite a high level of biomass, predominantly comprised of Kangaroo Grass (Themeda triandra). The burn was controlled with Aus Eco Solutions certified crew members and was conducted safely and successfully. An ecological burn was conducted within Eyensbury’s 1ha Scurf Pea Reserve in early May 2018. This burn was carried out in order to remove a layer of dead weedy biomass and exotic pasture grasses, to allow for a larger variety of biodiversity and inter-tussock spacing. This promotes the growth of native species and encourages plants like the threatened Small Scurf-Pea to flourish. Conducting this ecological burn within the Eynesbury Scurf Pea reserve will serve several purposes. It will help to create the inter-tussock spaces that are essential for most species of grassland herb to germinate and grow, both by removing excess cover of native grasses and by clearing out dead tussocks of previously treated exotic grasses. Burning also clears out a large proportion of the annual weed seed in the area. This will help significantly come Spring, as there will be lower amounts of annual grasses to brush-cut, giving more time to work towards other goals. Removal of seeds through ecological burning is the preferred control method for the species Wild Oat (Avena fatua) within the reserve. This ecological burn within the Scurf Pea reserve will also help to clear the ground of a significant cover of thatch that has been left behind from regular slashing and brush-cutting works within the reserve. Opening up bare ground will create desirable growing conditions for some of the sites most significant species such as the Small Scurf-pea (Cullen parvum) and Spreading goodenia (Goodenia heteromera), Slender Mint (Mentha diemenica), Bulbine Lilies (Bulbine bulbosa) and Variable Glycine (Glycine tabacina). Aus Eco Solutions staff are fully qualified in writing ecological burn plans, conducting and coordinating prescribed burns.